Taipei, March 21 (CNA) The annual South Taipei Fun Carnival in April will feature a tabletop game convention and range of activities that will highlight Taipei's cultural heritage, the organizers said Thursday. The four-day carnival will open April 4 with an exhibition, titled "Hello, Good 100," in celebration of the 100th anniversary of the Presidential Office building, the General Association of Chinese Culture (GACC) said at a press conference. The exhibition will also focus on 10 enterprises, including a Chinese medicine pharmacy, a tea store and two pastry shops, which have been in business in Taiwan for at least 100 years, the GACC said. This year, the annual carnival will feature a tabletop game convention, with experts from the board game industry sharing their experience and 10 Taiwan-based tabletop game companies displaying their latest products, some of which have not yet been released, the GACC said. 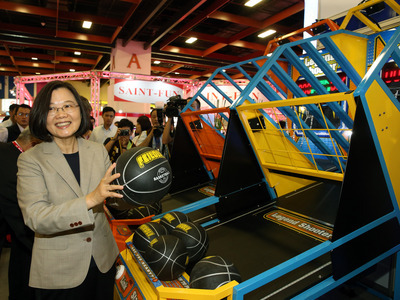 Among the participating companies will be Mizo Games and The Wonderful IsLand, which both produce board games that are based on Taiwan's history and modern politics, according to the event's Facebook page. Other attractions at the carnival will include a book fair at which local magazines and independent Taipei publishers will be featured, and a presentation of children's plays and films on April 4, Children's Day, according to the GACC. The carnival will coincide with the 2019 Presidential Office Concert, which will be held April 6 on Ketagalan Boulevard and is also being organized by the GACC, the association's Deputy Secretary-General Lee Hou-ching (李厚慶) said. At the concert, Taiwanese indie band Frandé and singer/actor Tsai Chen-nan (蔡振南) will be the headliners, according to Chang Wen-lan (張文蘭), head of the Presidential Office's Department of Public Affairs, who was also at the press conference. The South Taipei Fun Carnival was first held in 2018, attracting more than 600,000 visitors over eight days and winning the 2018 Golden Pin Design Award (GPDA) in the category of integration design.